Either you have a good diet or a bad diet. Perhaps you do not accept diet as having anything to do with health. Perhaps it does! Now I’ve slammed the medical profession a little but when an individual gets heart disease what do medical professionals want them to do? When you get diabetes what do they want you to do? When you have high cholesterol what do they want you to do? They change your diet. Perhaps they are wising up. Now wouldn’t it stand to reason if changing your diet will help these conditions, wouldn’t changing your diet before these conditions occurred prevent their occurrence or lessen their effect upon you. I think it would. Diet has everything to do with your health. I ask my clients if they have a good diet and most of the time they say, “Yes, I watch my diet.” Then we give them the diet test. Most everyone flunks it! Click on the question to reveal Dr. James’ answer to these questions. 1. Do you buy food that is labeled ''low fat''? “Fat free” is a term that is used by the food manufacturing industry in the hope to entice people to buy their product. Fat free food does exist but it is not manufactured by a company. Fat free foods are called vegetables and grains. If a product is labeled ” fat free”, and in it’s natural form it has fat, then they have done something to make it “fat free”. Generally these products have a tremendous amount of refined carbohydrates. Now the sad thing about this is that you think that you are eating “fat free” foods but your body turns the refined carbohydrates into fat and stores it in the tissues of the body. This is a contributing factor to high triglycerides and high cholesterol. So “fat free” is not truly fat free. But that does not matter to the manufacturing company because you bought their product and they have your money. 2. Do you buy food that is labeled ''sugar free''? Refined sugar is not good for the body. But it is 100% better to use in your diet than sugar substitutes. For example Nutra Sweet® and saccharin are chemicals that combine with other hormones and other elements in your body and these combinations can cause some severe problems. They change the fluid on the brain, can cause liver damage, nausea and dizziness. Sugar is not good but it is a lot better than the sugar substitutes that we have today. 3. Do you buy food that is labeled ''diet''? “Diet” food is not diet food! The body needs foods that will feed it nutrients, vitamins, and minerals. It needs these nutrients to be healthy, not foods that are devoid and empty and that just fill the stomach. Cravings come from deficiencies in the body, and deficiencies can cause health problems. 4. Do you try to follow the new ''Food Pyramid''? On the bottom of the food pyramid it says 6-11 servings of bread, cereal, rice, pasta group. Going up the pyramid the next section is divided in half, the right half says “2-4 servings of the fruit group” the left half says “3-5 servings of the vegetable group”. The next level is also divided in half the right side says “2-3 servings of meat, poultry, fish, dried beans, eggs, and nut group”, the left part of that section says “2-3 servings milk yogurt and cheese group”. The top of the pyramid says, “fats oils and sweeteners use sparingly”. If you will also notice on the bottom of the pyramid it says “the U.S. department of agriculture guide to daily food choices”. What does the department of agriculture have to do with the reality of what diets should be made up of? Nothing that I can see. 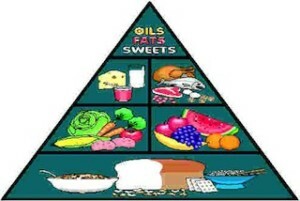 So when people see this pyramid they think, “I eat bread, fruits and vegetables, meat and cheese. But Oh! I need to stay away from fat”. It is such a misleading symbol, such a misleading diet to the people of America. The basic four food groups was better than the pyramid and it was terrible. Here is an article I wrote on the food pyramid. 5. Do you eat meat every day? I guess if you look at the food pyramid you should consume 2-3 servings of the meat group. In addition to that 2-3 servings of the dairy group. I guess the meat and dairy association got in on that one too? It is not necessary to consume flesh of any kind every day to be healthy it is a misconception. Vegetables and grains should make up the majority of our diet. 6. Do you drink your milk every day? If you enjoy milk that is fine but in order to have good health it is not necessary. When I say, “make sure you have enough calcium”, people automatically think “well I drink milk”. What did that poor ol’ cow eat to get the calcium in the milk? It ate green plants! There is more assimilatable calcium in green plants than we have or should have in our diet. Milk has calcium but a lot of people think “I’ll drink milk for my calcium but I don’t want all that fat so I will drink skim milk”. If the butter fat is not above 2% there is a good chance that they are not assimilating the calcium, because calcium requires acid and oil in the digestive tract in order to digest and be assimilated. 7. Do you stay away from salt? Salt is an important element of our diet. Salt could be used in cooking, during the cooking process. It should not be added to our food once it has been cooked. A better way to get salt in your diet is to use an organic form. Rock salt is a rock, we don’t digest rocks too well. Sea salt is a better form of salt but it still has elements that are organic. 8. Do you buy food according to, the new food label, on the back of the container? I sure hope you don’t! It has nothing to do with even tracking the ability of that food to have vitamins and minerals. It tells whether it has carbohydrates, fat those kind of things. It does not tell you the nutrient content of the food. It does not tell you how it was processed. 9. Do you only consume FDA approved additives, colors, and preservatives? If you eat an American diet you only consume those FDA approved additives, colors, and preservatives because the FDA does not allow them to go into food unless it has been approved. The only reason that the additives, colors, and preservatives are added is to make our food taste, look, and smell different. Companies that manufacture food can have it sit on a shelf forever and ever and not have bugs eat it because of the additives, colors, and preservatives. If bugs won’t eat it, why should we? You buy their product you give them your money but you also surrender your health. Additives, colors, and preservatives are not a part of a healthy diet. 10. Do you pay attention to your doctor when it comes to diet? Most doctors are educated on the proper application and use of chemicals. Unfortunately their education is very lacking when it comes to diet and nutrition. If they have that education they have gotten it after they have left school or have returned to school to obtain it. A good key to finding out if your doctor knows about nutrition is if he says, ” Don’t worry about taking vitamins and minerals just eat a balanced diet”. In 1932 the federal government had a study done. They found that it is impossible to have a balanced diet without supplementation. It has been over 70 years since that study has been done and what has changed in our diet? 11. Do you eat out quite a bit? In order to have optimum health it is important for you to purchase good quality food; grains, fruits and vegetables and to cook them properly. When you eat out you surrender that to the restaurants. Unfortunately in order to get people to come back a restaurant must have good food. Generally “good” to the American palate is sweet. That means refined carbohydrates, additives, colors and preservatives to name a few, and that is really not healthy. If you must eat out choose carefully.